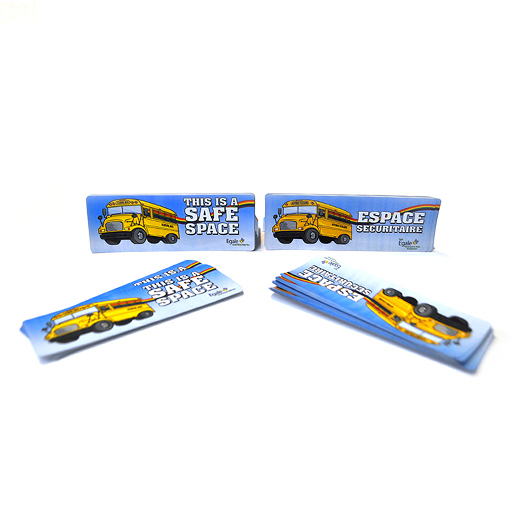 Every year, an average of five hundred Canadian youth take their own life (Statistics Canada, 2008). What is unknown, however, is how many of these youth identify as lesbian, gay, bisexual, trans, Two Spirit or queer, or are struggling with questions about their sexual orientation or gender identity (LGBTQ). 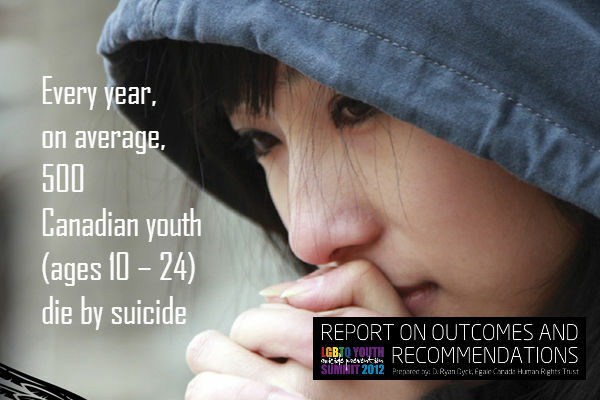 What is apparent today is that LGBTQ youth experience a high degree of vulnerability to suicidal ideation and behaviour, both in Canada and the United States, particularly in comparison to their non-LGBTQ peers: approximately half of LGBT youth have thought about suicide, and they are over four times more likely to attempt suicide than their non-LGBT peers (cf. Eisenberg and Resnick 2006; Scanlon et al. 2010; Massachusetts Youth Risk Behavior Survey 2009). 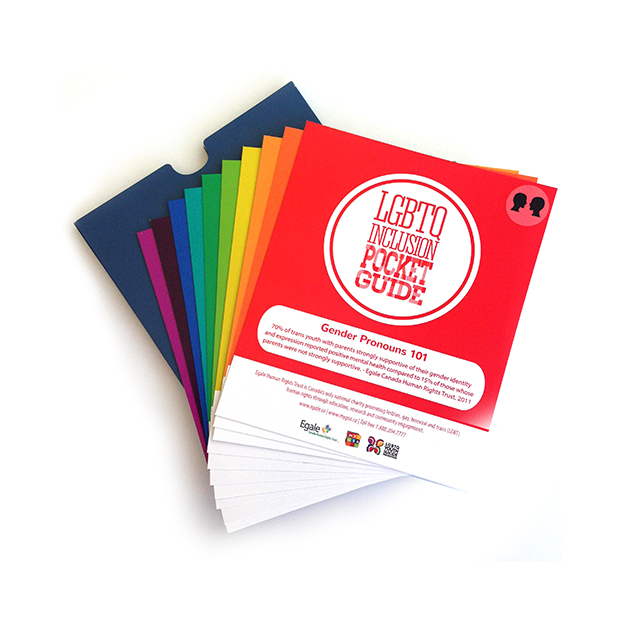 Nonetheless, LGBTQ youth are routinely and systemically ignored in research, education, and health and social service programming related to suicide prevention. This reality precipitates an urgent need for action and partnerships among researchers, educators, service providers, practitioners, LGBTQ community and youth agencies, policy makers and decision makers. 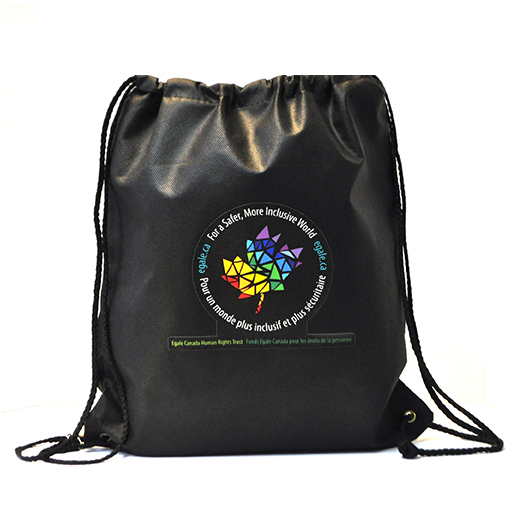 In response to this need, over fifty experts from across Canada and the United States gathered in Toronto on 30-31 May 2012, for the first ever Lesbian, Gay, Bisexual, Trans, Two Spirit, Queer and Questioning Youth Suicide Prevention Summit in Canada. The event was co-hosted by Ryerson University and Egale Canada Human Rights Trust, Canada’s national LGBT human rights charity, and sponsored by TD Bank Group. Participants included leading academics and researchers, educators, social service providers, medical professionals, coroners and medical examiners, LGBTQ and Aboriginal community leaders, and public policy developers. 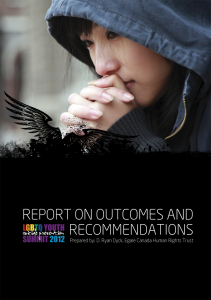 The Summit culminated in the drafting of twenty recommendations for the prevention of suicide among LGBTQ youth in Canada, including considerations for acute intervention and postvention care. These recommendations are by no means exhaustive; rather, they represent some of the most acute and salient needs identified by the Summit’s expert participants. By implementing these recommendations, significant changes could be made toward saving the lives of countless youth. However, participants recognized that there is no panacea that will end the tragic reality of LGBTQ youth suicide. No single recommendation, implemented in isolation, can be comprehensively effective: holistic change is critically needed, both structurally and individually. 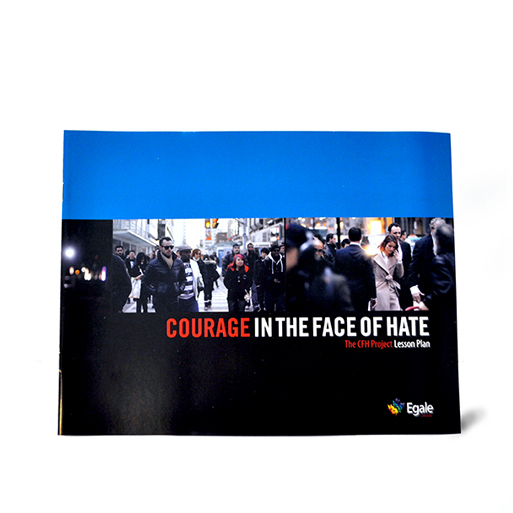 These recommendations, taken both individually and collectively, will begin to move us forward in the fight to end homophobia, biphobia and transphobia enabling more youth to achieve their full potential, unencumbered by hatred and bias. For the purposes of this paper, and for the LGBTQ Youth Suicide Prevention Summit, “youth” refers to those under the age of 25. 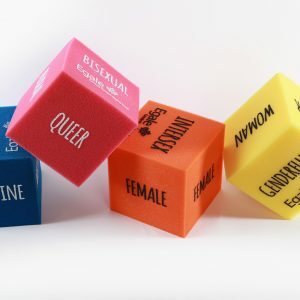 In this paper, the acronym LGBTQ references all people with diverse sexual orientations and/or gender identities, including those who identify as lesbian, gay, bisexual, trans, Two Spirit, queer or questioning.